The Virunga National Park was established in 1925 as Africa’s first national park and is a UNESCO-designated World Heritage Site since 1979. In recent years, poaching and the Congo Civil War have seriously damaged its wildlife population. The park is managed by the Congolese National Park Authorities; the Institute Congolese pour la Conservation de la Nature (ICCN) and its partner the Virunga Foundation, formerly known as the Africa Conservation Fund (UK). It straddles the equator, stretching from the lowlands at the bottom of the Rift Valley (680m) to the highest peak of the Rwenzori Mountains at 5119m. Its vast range of habitats includes rift valley lakes, swamps and acacia savannas, woodlands and forests, active volcanoes and rugged mountain slopes. Where is Virunga National Park Located? Virunga National Park is a sensational place to visit as it harbors a number of other animals like chimpanzees, hippopotami, bird species, forest and Savannah elephants and lions. Virunga National Park is home to about 300 of gorillas living mostly in the southern areas of the park. The national park is managed by the Congolese National Park Authorities, together with the Institute Congolais pour la Conservation de la Nature (ICCN) and its partner the Africa Conservation Fund. Gorilla Trekking is a magical experience of a life time which is worth to take due to the presence of these primates in Virunga National Park that are charming intelligent, smart and friendly to interact with. All treks begin at Bukima Patrol post taking 1-2 hrs. In Virunga National park there a number of different bird species that inhabit the thick forest vegetation.While still asleep, you will hear sounds and noise from the tremendous bird species which usually rise up very early and sing with in the trees at around 5:00 am and due to this, you will be compelled to get out of bed since the sound that comes from them is extra ordinary and persuasive. This will be an exceptional experience for it is rare to find anywhere else other than here at Virunga National Park. At Virunga National Park, one can go to various areas like the Gorilla Orphanage center at Senkwekwe situated in Rumangabo near the park headquarters where they will experience four gorillas that were saved from being trafficked by the poachers who hunt them in their natural habitat (thick forest vegetation) for exportation and trade. These include Maisha, Ndeze, Ndakasi and Matabishi who enjoy their home and these play, interact peacefully without fear of any harm since they are protected and secured by the park rangers who ensure these are safe annually for trekking by the visitors. This is a process where by a trekker spends more hours or even the whole day with the chimpanzees deep in the forest.Chimpanzee habituation started in February 2014 by a Congolese team trained by Frankfurt Zoological Society (FZS) and these formerly lived in the thick forests near the park headquarters in Rumangabo. They were habituated in Tongo forest a safeguarded area by the park rangers with a total number of 32 members hence making trekking them easy and simple annually by visitors worldwide. This process involves removing the fear of humans from the chimpanzees. This national park is 32 km west of Goma, the capital of North Kivu province. Transport from Goma to the park can easily be arranged with the Visit And Tour Rwanda. The Mikeno Lodge is a 90 minute drive from Goma and offers large bungalows and a good restaurant. The lodge and restaurant are located within a forest and they offer a beautiful view of the rift valley and Nyiragongo and Mikeno volcanoes. There is an abundance of bird life, as well as resident blue monkeys, colobus monkeys, and baboons. 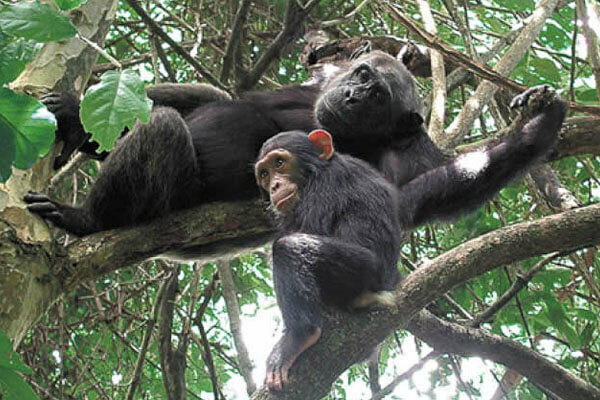 Chimpanzees are also frequent visitors to the area. Mikeno Lodge is a hidden gem within Virunga National Park that will not take long to be discovered. The bungalow accommodation is spacious, luxurious & very private, each with fabulous tree or valley views. Each bungalow has its own fireplace, which the staff light every evening while you are out enjoying the scrumptious dinner. The camp is just outside the Virunga National Park boundary lays the Bukima tented camp, which is one of the main starting points Virunga mountain gorilla treks. The camp was originally built for researchers, but is now used primarily by trekkers. As the name suggests, overnight guests at Bukima sleep in platform tents, but by camping standards they are quite plush. Each tent features an adjoining bathroom with running water and a nicely appointed bed and dresser for clothes. The views from the tent sites or anywhere in camp for that matter are spectacular. To the south, the view is dominated by Mt. Mikeno, whose 4437m (14,560’) summit towers over the gorilla sector. Across the valley is Nyiragongo volcano, whose lava lake colors the night sky with a red glow. Every few years, Nyamulagira volcano erupts and steals the nighttime show by spewing hot lava hundreds of feet into the air. Occasionally, the mountain gorillas themselves wander into the Bukima tented camp. Although this is highly frowned upon by park staff, it never ceases to impress the guests. Nyiragongo is a beautiful strato-volcano that features the world’s largest lava lake. The volcano’s forested lower slopes are home to a variety of animals, including chimpanzees, monkeys, and bush buck. Nyiragongo’s summit rim is largely devoid of vegetation and is frequently dusted with snow. From the rim, visitors can peer down into a churning lava lake and see and hear hot gases exploding up though a mosaic of molten lava. Tchegera Island Camp is the perfect way to escape the hustle and bustle of Goma or to relax after climbing Nyiragongo volcano. Situated off the northern shore of Lake Kivu, Tchegera camp offers spectacular views of the lake and four volcanoes. On clear nights, Nyiragongo and Nyamulagira volcanoes add to the drama by turning the night sky red with their glowing lava. There is also an abundance of bird life on the island, including African eagles, cormorants, herons and gulls. Whether one chooses to relax on the beach or explore other parts of the island in a sea kayak or by paddle board, Tchegera is the perfect place for rest and relaxation.